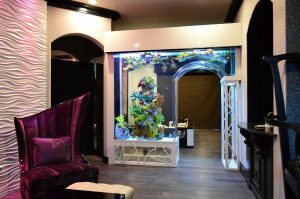 Over the years, Bottled Ocean has established itself as a premier designer for professional, commercial and residential custom aquariums of all sizes and types, specializing in projects that exceed 500 gallons. 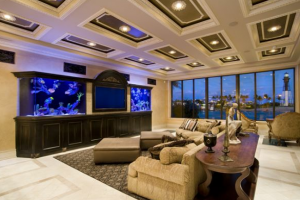 Working closely with top designers, builders and architects, Bottled Ocean creates one-of-a-kind tanks, as well as engineering and installing custom aquariums in existing structures. 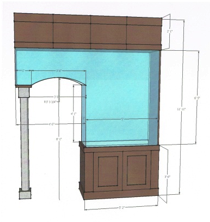 Pre-construction consultation helps our clients decide on the size, type and shape of the aquarium. Once an initial decision is reached, Bottled Ocean provides detailed estimates, engineering and CAD drawings for client approval. Upon approval, Bottled Ocean continues to work side-by-side with architects and builders to ensure that all water, power and support structures are incorporated into the site plans. Bottled Ocean also attends on site meetings during each stage of construction. 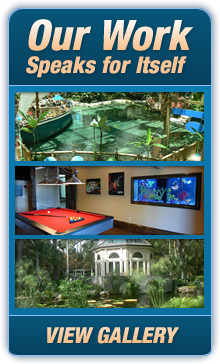 We also work with restaurants, nightclubs and commercial properties engineering and installing custom aquariums in existing structures. We have no limits on size or type of aquariums that can be conceived. 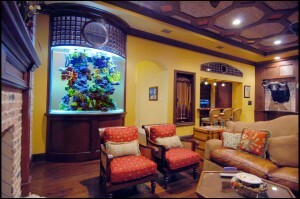 To enhance the experience, Bottled Ocean custom manufactures its own unique coral reef product. Our reef products are color-impregnated models that use no paint and are designed, sculpted and custom fit to any size aquarium. The result is true color throughout the entire thickness of the piece. 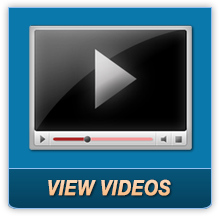 Brushing or scratching will never alter the carefully designed color scheme, eliminating costly remakes and repaints over time. Each piece of Bottled Ocean custom coral is designed, sculpted and custom fit to any size aquarium giving a new and different look for every project. Our signature hanging reef changes the face and space of the aquarium giving a new three-dimensional feel that replicates an underwater diving experience. Real animal interaction with Bottled Ocean’s simulated coral reef will amaze you. The less stressful environment promotes longer fish life and gives each aquarium what we refer to as “The Happy Tank” syndrome.